What started to evolve as the most agile and real-time enterprise data fabric, Data Virtualization is proving to go beyond its initial promise and is becoming one of the most important enterprise big data fabrics. Advanced data science techniques, such as machine learning, have proven to be extremely useful tools to derive valuable insights from existing data. However, they put the pressure on the data scientists to look for the right data and massage it into usable formats – a process that ends up consuming most of their time. In this webinar, we want to discuss the use of data virtualization to obtain the information needed in a more efficient and agile manner, show you the value added by this technology via a predictive analytics demonstration, and finally present a customer success story of this use case. •How does data virtualization help data scientists accelerate data acquisition and preparation? •How does the Denodo Platform for data virtualization integrate with popular tools from the data science ecosystem, like Spark, Python, Zeppelin, Jupyter, etc.? •How can you use the Denodo Platform to deal with large volumes of data more efficiently? •How is McCormick, a food flavoring giant, using data virtualization to season its machine learning and blockchain landscape? Organizations are adopting cloud at a fast pace and migration of critical enterprise information resources could be a challenge when dealing with complex and big data landscape. Building the right data services architecture can help alleviate the pain points, whereby Data Virtualization comes to the rescue by enabling the companies to gain maximum benefits from cloud initiatives in form of agility, cost savings and more. * How Denodo Platform's multi-location architecture can simplify and accelerate cloud migration. * Best practices of deploying Denodo Platform in the cloud. * Leverage Denodo's virtual data services layer to address and augment cloud solutions such as Data Warehouse modernization, Data Science, and Data Lakes in the cloud. * Watch a demo showcasing data virtualization and analytics in the cloud. By 2020, a corporate "no-cloud" policy will be as rare as a "no-internet" policy is today, according to Gartner, Inc. While cloud makes enterprises more flexible and agile, various cloud adoption scenarios such as hybrid cloud, infrastructure modernization and cloud based analytics present a few challenges of their own. Digital transformation is no longer a jargon and businesses are enabling better, faster decisions by rightly connecting and combining their data across on-premises and Cloud, including real time data. Explore the endless possibilities of how Data Virtualization can help drive success in this fast-paced, ever-growing complex data landscape. In a digital World data is really everywhere. It enables innovative use cases, optimizes internal processes and will significantly affect tomorrow´s businesses. The growing interconnectedness of people, companies, and devices has led us to a vast volume of data from an ever-widening variety of sources. This has resulted in the rising awareness of the necessity to implement a data strategy. In this webinar Jacqueline Bloemen, Senior Analyst BI at BARC and Becky Smith, Senior Marketing Manager at Denodo, provide an overview of the current state of data strategy and data governance initiatives from companies around the world, based on the findings of a recently conducted study. - What are the most striking benefits of data governance? - Which technological approaches are companies taking to control and provide data? - What are the critical success factors of effective data governance? Market research shows that around 70% of the self-service initiatives fare “average” or below. Denodo 7.0 information self-service tool will offer data analysts, business users and app developers searching and browsing capability of data and metadata in a business friendly manner for self-service exploration and analytics. - Real-world examples of data virtualization in action from companies such as Logitech, Autodesk and Festo. Data is fueling a new digital economy and compelling companies to rapidly adopt modern technologies such as Machine Learning, AI and Cognitive Science. Consequently, assembling the right blend of data from disparate sources using agile and flexible techniques like logical data warehousing to create purposeful, accessible insights is one of the greatest strategic tasks before us. To address the challenges associated with advanced analytics solutions, Neudesic uses a best-fit-engineering approach to enable enterprises to utilize the right tools for the right job to maximize their data and analytics strategy. When helping customers construct architectures that surface more data to an ever-growing number of data consumers without the need for data replication, Neudesic looks to Denodo as its tool of choice. * Why data virtualization should be part of your advanced analytics strategy. * How easily your use case will fit one of the numerous architecture patterns Denodo enables. * How Denodo’s innovative engine offers best of breed data virtualization capabilities, through a product demonstration. A complete view of the customer encompasses a single view of the customer, the customer’s relationships, and the customer’s transactions and interactions, resulting in increased customer satisfaction and retention as well as increased revenue through up-sell and cross-sell opportunities. - Providing real-time data access to the complete customer view, for any individual or organization across the company. - Reducing data replication and its associated costs and risks and providing access to cross-company data. Digital Transformation, even though a cliche, is definitely on top of every CEO's strategic initiative list. At the heart of any digital transformation, no matter the industry or the size of the company, there is an API strategy. Application programming interfaces (APIs) are the connection points between one application and another, and as such, they enable applications to build on each other, extend each other, and work with each other. Taken together, APIs represent a thriving ecosystem of developers that is showing no sign of slowing down. Self-service initiatives are successful when business users’ views of the data are holistic and consistent across distinct business functions as enabled by Universal Semantic Model across multiple analytical/BI tools. This 3 minutes video briefly demonstrates data virtualization capabilities, specifically when migrating to the cloud. See how you can integrate your data quickly and securely no matter where it resides. For IT professionals who are focused on data integration and enterprise data management and are overwhelmed by the growing number of data and data types, data virtualization provides real-time integration with agility to access and integrate disparate sources with ease. For business professionals, Data Virtualization brings agile information access that in turn drives business agility. 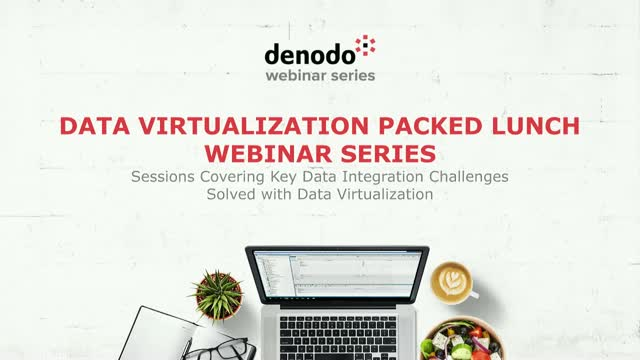 The webcasts provided in this channel by Denodo, the leader in Data Virtualization, provide the latest in common usage patterns, use cases, best practices and strategies for driving business value with data virtualization.